Since my first Single Note Exploration post about lily of the valley perfumes five years ago, I weren’t exploring the note much: the rumor about Malle’s possible venture into featuring this note in his next creation proved to be just that – rumor. Instead, he released magnolia perfume and sold the brand (not sure, in which order). Back then I had three perfumes in the “Lily of the Valley I Loved” category. I still wear my favorite Dior Diorissimo – not as often as it deserves but then I do not wear any of my perfumes too often. Instead of a mini bottle that I thought of buying, I got a full bottle of Lily of the Valley by Penhaligon’s (thanks to a kind friend). Even though I liked Guerlain Muguet and was contemplating getting a decant, later I realized that perfume itself, though nice, wasn’t what was driving the price. The main part of it comes from the unique, limited edition bottle. And I was admiring from afar yearly updates of those bottles but I decided that paying the proportionate price for juice without getting at least a chip off that bottle just wouldn’t make much sense. Last year, when I read that Thierry Wasser created a new perfume for 2016 LE of Muguet, I was mildly curious – but never got around to trying it. This year, when I saw the announcement for the new edition, I’ve got a strange reaction: I felt offended. Perfume prices went up significantly in the recent years: what was labeled as an “aspirational price” in 2010, became a mundane reality of new releases today. Guerlain, on the other hand, kept their limited edition perfume at the same price point all these years – around $500, give or take, dependent on the Euro rate, which isn’t cheap if you were to think about what goes into its production. It is Eau de Toilette – so about 10% of aromatic compounds, main of which, lily of the valley, is not even something that can be sourced naturally – it is a chemical compound. All of that was secondary while Guerlain was producing a limited number of special collectors bottles of that concoction: even if one wears that perfume as a signature scent, I doubt 125 ml of it will be gone in a year, in time for the next bottle, so, most likely, people were buying it not really for the juice itself. Muguet 2017 was launched in a differently colored but otherwise same bottle, in which they’d previously launched their perfume sprays for lingerie and wool/cashmere. They through in some “pristine white bells fashioned by the Maison Legeron are meticulously hand-embroidered by the Atelier and embellished with a fine, golden-beaded leaf.” But the result still looks much cheaper than their previous creations for this “special” perfume. We’ll never know, but I would be really curious to know how the sales of this year’s LE fares compared to other years. For one, I’m not even tempted. Today, for the May 1st, I’m wearing Penhaligon’s Lily of the Valley. Its ribbon is not as impressive and definitely not hand-anything. Its original price is, in my opinion, still too high for what it is. 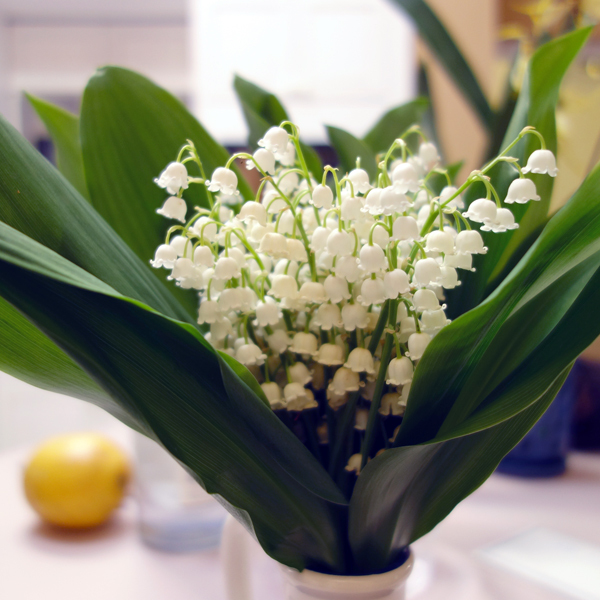 But it is light, spring-like, very uncomplicated and believable lily of the valley perfume. And it can be had almost for a song from discounters. Images: All but the last one – my own (I re-used pictures of Rusty from the previous post – just in case you haven’t seen them before); the last one – from FragranceNet (they have a really good price for this perfume – no affiliation). This entry was posted in "Four legs good", Perfume News, Single Note Exploration and tagged Guerlain, lily of the valley, muguet, Penhaligon's. Bookmark the permalink. The Guerlain Muguet LE saga passed me by, possibly for the best now that I have heard more about it. I like LOTV, but it is not a note I seek out, that may be why. I suppose I am always expecting it to fall a little short of the real thing. Though Diorissimo is pretty darn lifelike. Can’t bring the Penhaligon to mind, though I know I had a sample once. Have you tried Hermes Muguet Porcelaine? How cute are those pics of Rusty!?! He looks as though he is dancing round the maypole. ;) And I laughed at the comment about your not wearing any perfumes too often. We are all that soldier. I think that these pictures of Rusty are ones of the cutest pictures of him I’ve ever published – partially that was a reason I decided to re-use them. All three LotV perfumes that I loved, including Guerlain’s one, were very close to the real flower – I ran, so to speak, side-by-side comparison with the plant on that picture with Rusty. I quite like the Hermès Muguet and in Australia we have a singer Jessica Mauboy who brought out a melon/muguet that I think overshadows most other LotV fragrances for wearability and ease. Shall I send you a decant? It was very inexpensive and I have a bottle that will never get used up. I will probably give Muguet a try the next time I see it at a store though Hermes is not my brand: I own and wear several perfumes from the Hermessense line but they all are a little bit too sheer for my liking. My initial thought was to politely decline your kind offer since I’ve never heard about that singer before and I’m not much into celebuscents. But since recently discovered for myself a couple of singers – one from NZ, one from Australia – I decided to read more about who Jessica Mauboy was and I’m extremely impressed: she seems to be an extremely talented person. I’ll try to listen to something by her tomorrow but I think that I’d love to try her perfume. Great. I’ll send you some. Jessica Mauboy has a great voice and has done quite a lot of acting. Originally one of the Australian Idol contestants, can’t remember how high she got but it wasn’t a win. According to Wikipedia, she was a runner-up. But since then it looks like she was quite busy. And successful. Oh yes, I’ve seen a lot of muguet in my Instagram feed yesterday. But still I think the tradition of gifting lily of the valley flowers is a typically French thing. In Poland, muguet definitely is not associated with celebrations of 1st of May. In fact because of rose de mai, month of May is more tied to a rose flower, which is why I wore Puredistance White the other day. Not only Lily of the valley did not associate with May 1st when I was growing up, I don’t think they bloom at that time yet: we usually had late spring. But apart from the celebration, I always loved these flowers. Lily of the Valley is not my flower of choice, but I love the flowers themselves. Growing up in Minnesota where the temps are cold, one side of our house growing up was flush with Lily of the Valley that bloomed in the spring. I was always amazed that they thrived on the north side of the house where it was coldest and with the most shade. The grass was always so cool there too :) You just made me have a nice memory. Thanks. And kisses to Rusty. Following your memory I tried to figure out, on which side of my Grandma’s house lily of the valley grew… I think it was the east side but it was also in shadow area. I have nothing to contribute on LOTV perfumes. Still looking for my holy grail, although years ago loved the more vintage DIorissimo. But just wanted to stop by and say that Rusty and the muguet are a particularly adorable pair! First off…Rusty! My goodness! How do you get such fantastic pictures of him!?! I love lily of the valley both as flowers and as a note…but honestly I cannot think of any perfume in my collection now that is showcases lily of the valley….I am sure I have something but nothing spring to mind! I think LotV is good in the supporting role in perfumes (while as a flower it doesn’t really mix with anything). Rusty the dancing cat. What can’t he do? The pics of him are fabulous – he is very photogenic! As to ummmm, LOTV, meh meh meh. Yeah-yeah, I know everything about you and that note :) BTW, have you smelled the live flower? If yes, what do you think about the scent? I don’t believe I’ve smelled live LOTV. Are these typically sold at flower shops? I may also stop by Whole Foods Market – they have an extensive selection of flowers. It’s very seasonal so I don’t think it’s easy to come by. I haven’t seen any in years. But if you come across them, please give them a sniff. LOTV in Diorissimo is SO lovely that I’ve never really expected any other LOTV to compete. My Mum wore both Diorissimo and Muguet de Bonheur (Caron) and so those are my comparisons. The Guerlain May day LEs were always too pricey for me, and if I had that kind of money- well- straight off to Mandy Aftel or JAR! You know, actually I agree with you: I don’t think I’d consider spending that much money on perfume from Guerlain – unless it was some really beautiful bottle (and I would be into collecting those). I love Miss Dior Cherié and J’adore Dior. They are some of my fave Dior fragrances. Great post by the way, hun! Very informative and engrossing. I have the perfect clothes, shoes and bags to go with your perfect perfume! So trés chic!